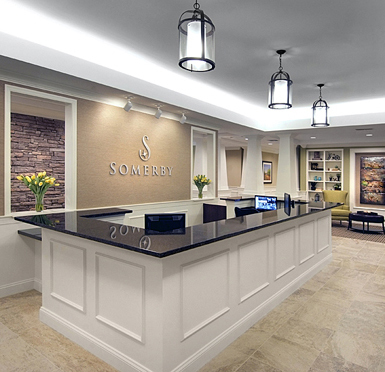 Rule Joy Trammell Rubio provided master planning, architecture, interior design and FF&E for the Somerby Community on a 19 acre site in Peachtree City, Georgia. The assisted living and memory care building is 78,994 gsf and consist of 72 assisted living and 24 memory care units. 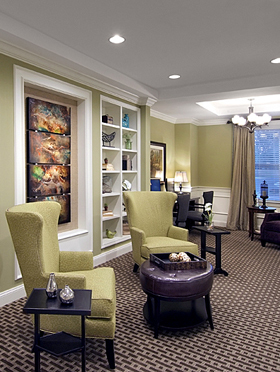 The two-storycommunity includes separate dining rooms for assisted living and memory care, a bistro used by residents and their guests, a full-service kitchen, ﬁ tness and wellness center, theater, creative arts studio, library and computer center, and family visiting rooms for casual entertaining. The independent living building is 140,162 gsf and contains 101 independent units in a four-story building. 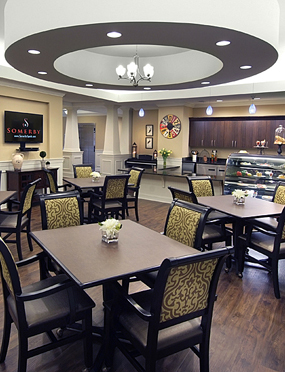 This building contains the same amenities as the assisted living building on site, including its own dining room and bistro. In addition, the independent living building also features a therapy pool. The site also houses 9, two bedroom, open ﬂ oor plan villas with a single car garage and private golf cart parking. Throughout the community, residents can take advantage of in-demand amenities such as Wi-Fi access, outdoor spaces and walking paths, and a day spa with hairstyling, manicure stations. On-site golf carts and parking/storage are also available for residents to compliment Peachtree City’s 90-mile network of multi-use paths for pedestrians, cyclists and carts.